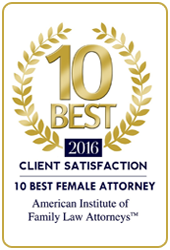 Chicago, IL – September 1, 2016 — Hoffenberg & Block founding partner, Gloria E. Block, has been named to the American Institute of Family Law Attorney’s (AIOFLA) 2016 “10 Best Female Attorneys” list. 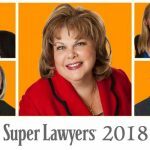 According to the AIOFLA, inclusion on the list is an exclusive honor and extended only to those select few who have reached the top of their profession based on superb client satisfaction and industry leadership. 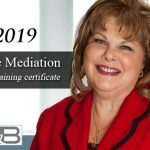 As a founding member of top-rated Chicago family law firm, Hoffenberg & Block, Ms. Block dedicates her practice exclusively to matters related to family law including divorce, paternity, allocation of parental responsibilities (formerly known as child custody), child support, spousal maintenance and alimony, modification and enforcement of existing orders as well as prenuptial and postnuptial agreements. The AIOFLA highlights Attorneys that have achieved unparalleled success but most importantly have done so for the benefit of their clients. 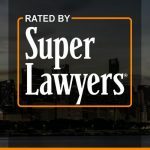 Their rating system helps clients throughout the United States make educated decisions when it comes to choosing the best family law attorney in Chicago. AIOFLA Membership is an exclusive honor and is extended only to those select few who have reached the top of their profession while doing so with the client’s satisfaction being of the most paramount importance. AIOFLA thoroughly researches their attorneys and criteria for selection consists of nomination by a client and/or peer, 10/10 in client satisfaction, no negative feedback of any kind, they represent an industry leader, no bar or ethics complaints of any kind. 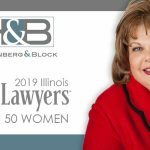 In addition to her inclusion in the AIOFLA “10 Best Female Attorney” list, Ms. Block has the honored distinction of being a multi-year recipient of the Illinois Super Lawyers designation as well as being awarded and recognized by Leading Lawyers, Avvo Client’s Choice, The National Advocates Top 100 and Top Law Firms in Chicago Ms. Block received her J.D. from Loyola University Law School in 1980 and her B.A. from the Northwestern University in 1977.